NEW DELHI: The Rafale deal took a new turn on Friday with an English national daily publishing note of the defence ministry dated November 24, 2015. However, defence minister Nirmala Sitharaman sought to bring out the complete facts behind her ministry’s note by subsequently quoting its full contents in the Lok Sabha. According to the English daily which published the report, the defence ministry had objected to “parallel negotiations” that were being carried by the Prime Minister’s Office (PMO) with the French government. The defence ministry note stated that such parallel discussions by the PMO had "weakened the negotiating position of Ministry of Defence (MoD) and Indian Negotiating Team", and drew the attention of the then defence minister Manohar Parrikar. 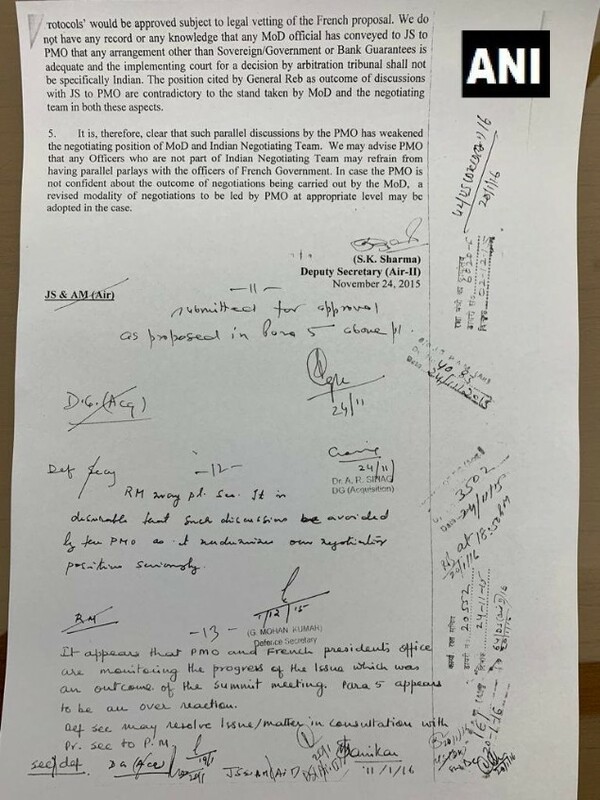 The note further said, “We may advise PMO that any Officers who are not part of Indian Negotiating Team may refrain from having parallel parlays [parleys] with the officers of French Government,” and suggested that “in case the PMO is not confident about the outcome of negotiations being carried out by the MoD, a revised modality of negotiations to be led by PMO at appropriate level may be adopted in the case”. However, defence minister Nirmala Sitharaman said in Lok Sabha that Parrikar had replied to the MoD note and asked the officials to “remain calm” and there was “nothing to worry, everything is going alright”. News agency ANI tweeted the full note of the defence ministry consisting of Parrikar’s reply to his officers. Parrikar, as the then defence minister, termed the officials’ apprehension as an “over-reaction” and asked the then defence secretary to resolve the matter in consultation with Prime Minister Narendra Modi’s principal secretary. Parrikar, in his noting, said, "It appears PMO and French President office are monitoring the progress of the issue which was an outcome of the summit meeting. Para 5 appears to be an over reaction. Defence secretary (G Mohan Kumar) may resolve the matter in consultation with principal secretary to PM." Meanwhile, Kumar, who was the defence secretary then, has been quoted by ANI as stating that the dissent note of the MoD on Rafale negotiations had nothing to do with price. It was about sovereign guarantees and general terms and conditions, he added.